What is the best location for a ReWilder to live? I’m asked this question quite often, and in this episode, you’ll learn some important criteria to consider when thinking of where you want to live long-term. Joel Skousen — pioneer in the preparedness movement, author and publisher of the World Affairs Brief — joins us to discuss strategic relocation. From potential environmental and governmental threats to ReWilding lifestyle requirements, there is much to factor in when strategically relocating. Do you want the freedom to homeschool or practice alternative medicine where you live? Do you want to have access to wild places to forage, fish or hunt? Joel shares grounded insights from his comprehensive work in analyzing some of the best (and worst) places to live in the US for your best chance for long-term, optimal living. He ventures into some conspiracy areas at times, but this interview is primarily focused on providing you with a practical perspective on selecting your ideal ReWilding location. In the introduction to the show, I add some of my own personal criteria for an ideal living situation. As you listen to this show, be thinking of what criteria you would add to Joel’s list to lead a life rich in the culture of the NeoAboriginal! Daniel answers some listener questions! What ReWilding criteria should you consider when moving to a new location? Are nuclear power plants a major threat? 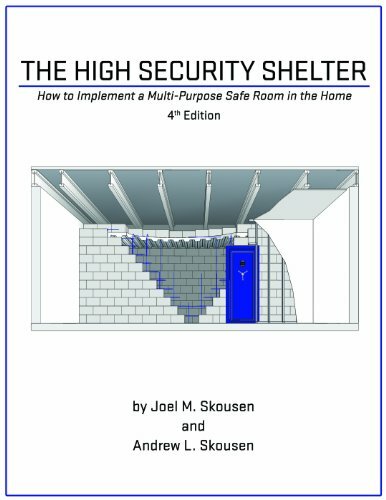 Design and cost of building a “safe room"
**There is a faint background buzzing in the introduction to this show. Apologies, and thanks for bearing with us! Joel Skousen is a political scientist, by training, specializing in the philosophy of law and Constitutional theory, and is also a designer of high security residences and retreats. He has designed Self-sufficient and High Security homes throughout North America, and has consulted in Central America as well. His latest book in this field is Strategic Relocation--North American Guide to Safe Places, and is active in consulting with persons who need to relocate for security and increased self-sufficiency. He also assists people who need to live near a large city to develop contingency retreat plans involving rural farm or recreation property. Joel was raised in Oregon and later served as a fighter pilot for the US Marine Corps during the Vietnam era prior to beginning his design firm specializing in high security residences and retreats. During the 80's he took a leave of absence to serve as the Chairman of the Conservative National Committee in Washington DC. and concurrently served as the Executive Editor of Conservative Digest. For two years he published a newsletter entitled, the WORLD AFFAIRS BRIEF, and served as a Senior Editor of "Cogitations" a quarterly journal on law and government . The World Affairs Brief is now back in publication and is available as a weekly email newsletter or in a monthly print edition.